Image credit Marvel Entertainment/ Disney. 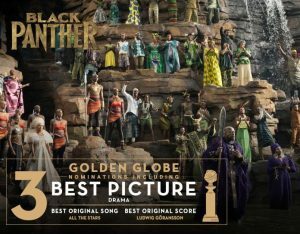 The 2019 Golden Globes nominations were announced today and the Marvel Studios film Black Panther received 3 nominations including Best Picture Drama. The other two nominations were Best Original Song and Best Original Score. 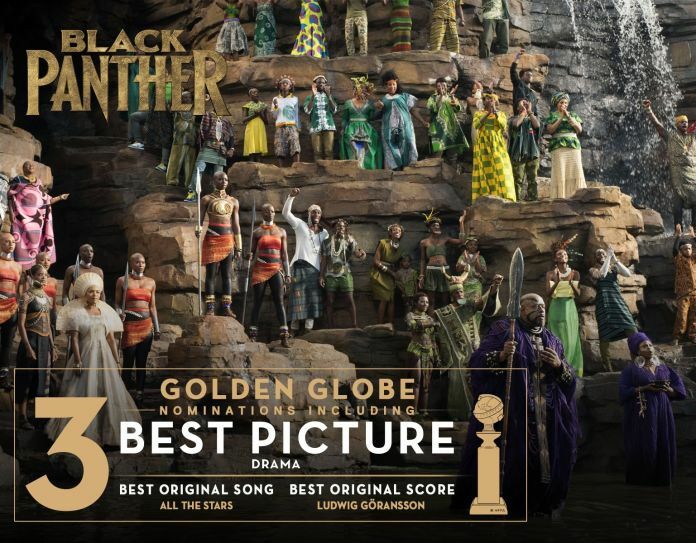 According to CNN, not only is Black Panther the third highest grossing film in the United States but now it is the first superhero movie to receive a Golden Globe nomination for Best Picture Drama. Many people believe that winning a Golden Globe is a great indicator of winning the Oscars. The movie included an amazing storyline that hit home for many in the African American community and the community at large. The 2019 Golden Globes will take place on January 7th (Sunday), at 8PM EST. and will air on NBC. Sandra Oh and Andy Samberg will be hosting the 76th annual awards show. For more information on the Golden Globe nominations got to https://www.goldenglobes.com/winners-nominees.